Incubation for Beginners by Brinsea, Inc.
Incubation for Beginners – Hatching your own chickens can be an educational and rewarding experience and with the right equipment and some best practices you can be on your way to having backyard chickens in no time. Incubation allows backyard poultry enthusiasts to hatch chickens and ensure the eggs are developing correctly in a controlled environment. Incubators are able to control the temperature, humidity and turn the eggs automatically making the egg hatching process stress-free. While you can incubate eggs any time of the year, spring is considered the best time to raise chickens because of the warmer weather which is ideal for new chicks. If you’re considering hatching your own flock of backyard chickens, (Best Nutrition Plan for Healthy Chickens) here are a few tips that will make egg hatching a success. To find a quality incubator, we recommend looking at the functionality. Does it have an accurate temperature control? Can it be cleaned easily? Can turning the eggs be done automatically? You’ll also want to look at the sizing. For example, how many eggs, and what type of eggs does a specific incubator hold? Especially as a beginner, these are important qualities to look for in an incubator to ensure yourself the best possible chance at successful hatching. Also, read the reviews, and don’t be afraid to ask questions, either to the manufacturer directly or in online social spaces. Once you’ve decided on the right incubator for your situation, you’ll need to find fertilized eggs. If you already have hens and a rooster then you are good to go. If you don’t have a rooster, then it’s always best to source your fertilized eggs locally because they will be fresher and their chances of hatching won’t be affected by shipping. Before setting the eggs in the incubator, read through the incubator’s manual to ensure everything is working properly. An important step to note is to make sure the eggs are at room temperature before setting them. Once eggs have reached room temperature, place them in the incubator on their side or pointed end down and do not adjust the temperature for 24 hours. 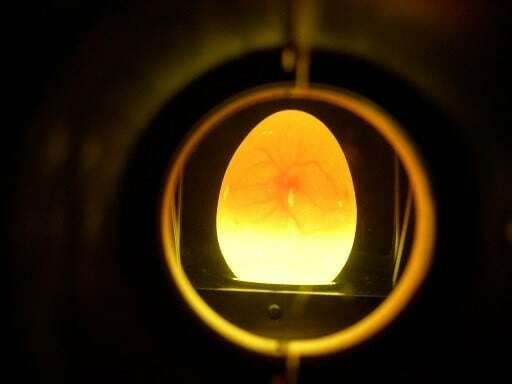 In order for the fertilized eggs to develop correctly, they need to be kept at the correct temperature and turned often and positioned in the right way. Humidity is also crucial because eggs breathe and lose water through the pores of the shell. Small changes in temperatures can cause eggs to develop too fast or too slow which could result in deaths or deformities. The correct temperature for most species when incubating is 99.5°F when using a forced draft incubator. However, there are incubators without fans and if you are using one, the temperature should be set at 103°F because hot air rises. No matter the incubator, room temperature should always be between 68°F and 78°F and kept out of direct sunlight to get the best results. Incorrect humidity is one of the main causes for poor hatching success because it is the most difficult to measure and control accurately. Humidity is important only to achieve the right balance between excessive dehydration and space within the egg to allow the chick to maneuver into hatching position. Humidity is affected by evaporation from the eggs themselves and the incubator water reservoirs. All incubators have water reservoirs and ventilation holes, some have digital humidity displays and ventilation controls. Humidity levels are measured in % Relative Humidity (% RH). Ideal humidity during incubation is 40-50% RH for poultry and game birds and 45-55% for waterfowl. If the humidity is too high, you will need to increase the ventilation or if the incubator does not have a ventilation control, remove water. Conversely, if humidity is too low, you will need to reduce ventilation and add water. Humidity at hatching time needs to be higher than during incubation, at least 60% RH to prevent the membranes of the egg drying too fast as the chick hatches and becoming tough and difficult to tear. Positioning and turning the eggs is important for egg development because as the embryo develops on the yolk, it causes the yolk to become lighter and float upwards. When the egg is turned, the embryo moves downwards into fresh nutrients in white of the egg allowing the embryo to develop. Note that most modern incubators turn the eggs automatically. 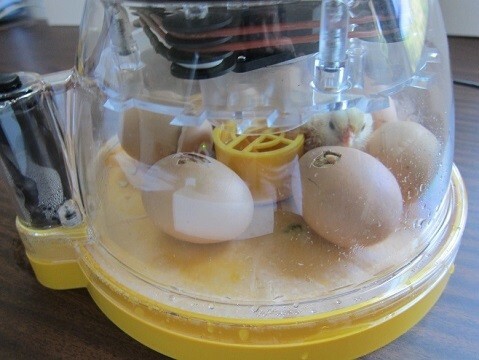 Using an incubator with this automatic feature is the best way to ensure the eggs are turned consistently and accurately. However, if you are turning eggs manually, mark each egg with and X on one side and O on the other with a pencil. This helps with remembering what side they need to be turned to. This should be done a minimum of twice a day, to prevent the embryo sticking to the sides of the shell. Turning should be stopped two days prior to when the chicks are scheduled to hatch. Certain models with the automatic turning setting will also stop turning the eggs two days before they are due. An incubation period varies between birds but for chickens, it takes 21 days. To check on the state of the embryo, the candling method is used. In the past, people would use candles to shine on the eggs to see how the development process was going. Now we are able to use LED lights which don’t emit heat. Eggs can be candled after 5 days of incubation and every few days after that. For best results, light the eggs in a dark room. Initially, you will be able to see a small embryo and a web of blood vessels radiating from it. As the chick grows it will be hard to make out detail but you should be able to see movement. However, if the egg is infertile it will remain clear and eggs that have died will show a dark ring. Two days before the eggs are due to hatch, you should stop turning and make sure the water reservoirs are filled. Humidity will need to be higher than normal so it’s important not to open the incubator. It will take about 24 hours or more from the first bump on the shell until the chicks fully hatch. After the chicks have hatched and are fully fluffed, transfer them to a brooder where they can stay warm. This experience is very exciting so enjoy watching how your eggs develop and have fun. For more information on incubators and chicken hatching, visit www.brinsea.com.